We're finishing up our "Thanks, Dad!" campaign this week. Through November, we’ve given you tips and advise for raising a thankful child, showing thankfulness in your home, creating a memorable Thanksgiving and now we want your family to cultivate an attitude of thankfulness that continues beyond the Thanksgiving holiday! One of the best ways to express thankfulness is to give to others! Check out our five ways of saying thanks through giving and be intentional about teaching and modeling these ideas with your kids today. Give Your Time: Whether it's volunteering at the local homeless shelter, participating in a community clean-up day or taking an hour to make cookies for your neighbors, investing time to help or encourage others is a great way to cultivate a thankful attitude or to say thanks to those who have helped you. When you take time to get your kids involved in the process, they will have fun and you will connect as a family as well! It's important that you explain to our child what and why are you giving your time to help others. You can explain in more detail depending on the age of your child. The point here is to not only give, but to teach your child about giving in the process. Give Your Talents: If your kids have musical or singing talent, nursing or retirement homes always welcome having young people to play or sing for their residents. If you're a handyman, consider offering help a single mom in your neighborhood with seasonal "honey-dos" and bring your kids along to help. There's an opportunity to serve for every kind of talent! Give Your Things: A couple times a year, encourage your kids to sort their clothes, books, and toys and set aside items in good condition and donate to a homeless shelter. This will help your kids realize how much they have to be thankful for and to experience the joy of giving to others who have less than them. It will also provide you a way of getting your kids to clean their rooms; at least twice per year. Go ahead and mark two cleaning dates on your calendar! Give Your Thoughts: Giving doens't have to mean money. Encourage your children to take a moment to say something thoughtful to the people around them, whether it's "thanks," "you look nice today," or "I appreciate your friendship." Set the example by regularly saying thoughtful and encouraging things to your family members and others. Remember, this attitude starts with you--the parent! How you talk and interact with people teaches your children to react the same manner. Give Your Treasure: For those with more money than time, consider supporting charitable causes and organizations financially. Encourage your children to donate a portion of their allowance or income to a specific cause. Talk with your kids about the charitable organizations you contribute to and why you give to those groups. Again, it's important to give, but it's also very important that you children know the why behind the what. Use giving as a teachable moment for your family. As you and your children give, you will find it easier to notice all the things you can be thankful for in your life. Start saying "thanks" by giving today! 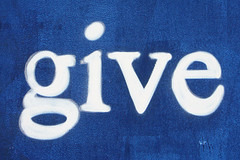 What's one thing you could change in your weekly schedule to help you and your family show thanks through giving? Visit our "Thanks, Dad!" page for more on how you can connect with your family and other dads just like you! Don't forget to say, "Thanks, Dad!" by recording a video, sharing a picture, or writing a short note on this blog, Facebook or Twitter @TheFatherFactor. Use the hashtag #ThxDad to tell the world why the dad in your life deserves thanks!